A Christmas treasure hunt is taking place in Edinburgh which could net you a gift card worth up to £100. On Thursday 6th and Friday 7th December, people who live and work in Edinburgh are being encouraged to join a ‘treasure hunt’, led by Essential Edinburgh via their @EdinCityCentre social channels. One card per day will be hidden in a secret location in the city centre, with clues posted about their whereabouts on the @EdinCityCentre Twitter and Instagram channels. Thursday’s card, valued at £75 will be hidden from 5pm, ideal for after-work late night shoppers - and Friday’s card, valued at £100 will be ready and waiting to be found from 12.30pm, making a lunch-time dash around town all the more exciting. Covering 70 outlets across the city centre, two lucky winners will be given a head start on their Christmas shopping. Chief Executive Roddy Smith of Essential Edinburgh said: “The card has been introduced to showcase our vibrant and varied city centre and with over 70 businesses currently signed up, it really does. “From retail to hospitality and beyond, there is a city centre business to suit all tastes and budgets and so the Edinburgh Gift Card makes a perfect gift option for those that are particularly tricky to buy for. 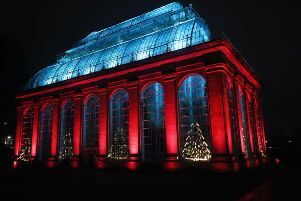 For those who can’t join the treasure hunt, but want to give the gift of the city centre this Christmas, the Edinburgh Gift Card can be purchased online via www.edinburghgiftcard.com with values ranging from £10 to £500. The cards can be redeemed in a single transaction or spread out across the varied outlets.